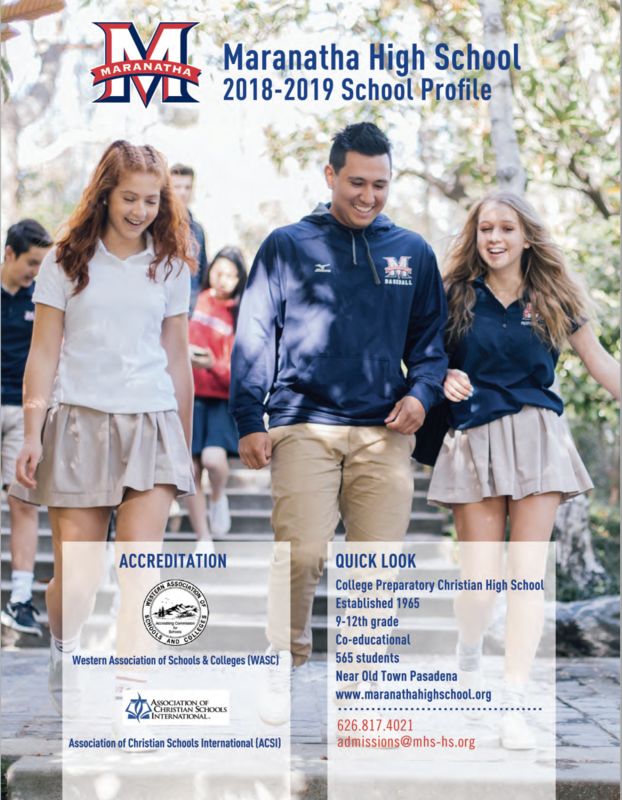 Please note: Applications for admission to the 2019-2020 school year are now being accepted. Register online for the ISEE (Independent School Entrance Exam) at http://erblearn.org/parents/admission/isee. Click “Register For ISEE At A School Test Site” and fill in the required information. Click “Select a Test Center Consortium” and scroll to Pasadena Consortium. Submit the four reference forms (School Administrator, Math Teacher, English Teacher, Pastoral/Mentor) through our application portal to the appropriate people at the student's church and current school. They will then be able to submit the completed reference forms to Maranatha with the link provided them. Upload a copy of students 7th and 8th grade transcripts (or complete high school transcripts to date for transfer students) through our application portal or submit the Transcript Request Form to the student's current school to have the school send them to us. The transcript request form is available as a fillable PDF form. You may download a copy of the PDF form to your computer and submit it to the appropriate person to complete. Students with learning needs must also supply current (less than 3 years old) documentation of assessment testing and/or make arrangements to have tests completed by March 1, 2019. The psycho-educational assessment will include academic as well as psychological testing. Decisions on admissions will occur when the school has received requested documentation. Please contact Rachel Pontón, Admissions Associate, at (626) 817-4021 to inquire further about the admissions process.